I have this tendency to get way too focused and zoned in on work. I end up working hours upon hours at night and pouring in to design projects, emails, the blog, and other projects. It can get to a point where I lose track of time, exhaust myself, and even forget to eat most of the day. Not cool and a little crazy because it is not always necessary. From time to time there are moments when life can get a little hectic. Maybe you have a deadline looming and have struggled to develop the perfect idea. Maybe you are juggling too much. Whatever it may be it has can happen and that is life, but when you are seeing a pattern of late night after late night for really no reason it is time to check yourself because you truly wreck yourself (sorry I just had to). 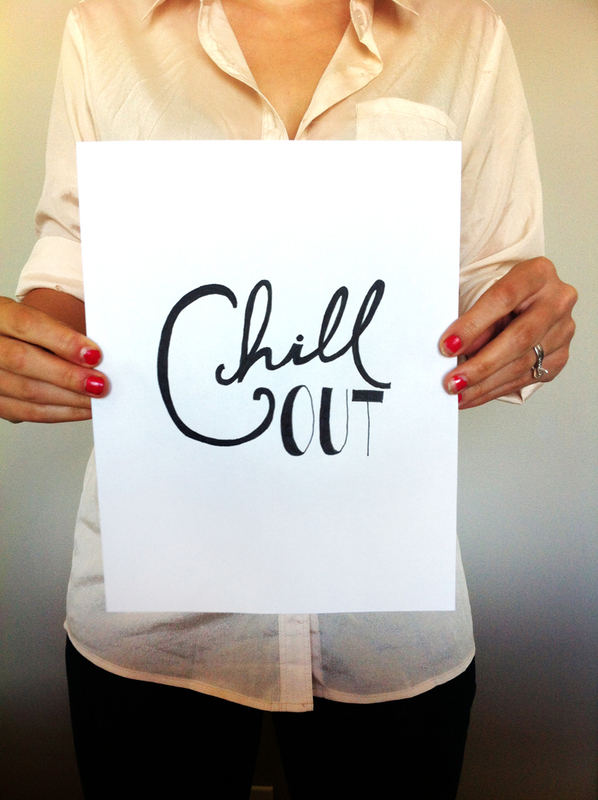 Sometimes we just need someone to say you need to chill out and relax. Stop everything, leave your desk, grab your favorite drink, sit in the sun for a little bit. My favorite thing is to find a way to schedule breaks in to my day. I always felt I had so much to do but I found by scheduling times to break and work out, cook dinner, or grab coffee for an hour with a friend I become more efficient and got more done. This allowed for me to find time to relax more often. As a creative your time away from your computer is more important than anything. So find ways to value it more than the time you work. Learning a rhythm has helped me feel more relaxed and less like my life is up in the air as a creative. There are still times it doesn’t all go as planned, deadlines pile up, client meetings stack up, and emails feel like Mount Everest, but always find a way to relax take deep breaths. Find balance, relax, and take one thing at a time. Set your deadlines in a comfortable spacing for your pace of work and life and learn to prioritize. Your time you spend relaxing will actually feel relaxing. I love how the universe provides you exactly what you need, at the moment you need it. I needed this post of yours today, more than any other day, as I sit here hungry and frazzled from working all night and day. Thank you for the reminder to just stop, and go get something to eat. You are sooo right! I know exactly what you mean – I’ve been doing it this week! It IS crazy! Agree with Lauren, Thank you for the reminder to just stop and go get something to eat: I don’t have much to eat in a day, sometimes just one meal! And work through the night! But got too much & ended up sleeping all today & being sick! So it’s maybe not the best! You are so absolutely right! And I really need to remind myself of these things especially when it comes to work on the computer with my blog, website, webshop, photo editing etc. It seems like there are no end to these things. I can just keep on going… Definitely not good and in the end it’s really bad for creativity as well.